What’s the best dog dryer on the market? That’s a question you’re going to need to know the answer to if you bathe your dog at home or if you’re a professional dog groomer. 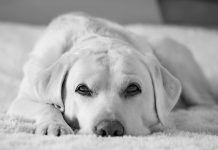 In this article, we’ll look at what types of dog dryers are available and discuss how to choose the best dog dryer for your pet. Bathing a dog is very important for his health and well-being. Giving your pet a regular bath is a great way to bond with him. Bathing also helps to remove loose hair and dead skin, keeping your pup smelling fragrant and ensuring that his coat and skin stay in great condition. If your dog has a skin condition, regular bathing with a suitable medicated shampoo may be necessary to keep him comfortable. Why Use a Dog Dryer? Although it’s perfectly acceptable to dry your pet with a soft, fluffy towel after his bath, long-haired breeds can take quite a while to dry completely. 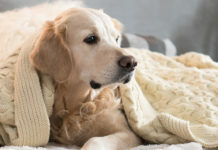 A damp dog will be more prone to catching chills, especially during the winter. Not to mention the mess a soaking wet dog can make of your home décor and furniture. That’s where dog dryers and blasters can come in handy. Dog dryers or blowers are very effective and safe for use on animals. Dog dryers are designed to be much quieter than those made for humans. However, some dogs are frightened by the noise and sensation of the dryer, which can make the whole experience stressful. Home groomers and those at the beginning of their business venture would probably be best starting off with a combination drying machine. 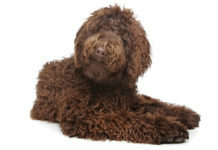 More established professional dog groomers would benefit from having a separate finishing blaster and finishing dryer. The best dog dryer must firstly be safe. A good dog dryer will also be effective. Many regular dryers aren’t powerful enough to dry a dog’s thick coat. Some dryers are unsafe because they are just too powerful and produce too much heat. That’s why you should always buy a proper dog dryer for your pet. If your dog is nervous, make sure that the dog dryer you choose is quiet. Choose a dog dryer that has different temperature settings to choose from. A dog’s skin is more sensitive to temperature than yours. Also, some areas of your dog’s coat will be thicker than others. What you find comfortable, your dog may find burning. A dryer with variable temperature settings ensures that your dog will always be comfortable. Before you begin using the dryer on your pet, check the temperature against the sensitive area on the back of your wrist. If it’s comfy for you, it should be fine for your pet. You also want to choose a dog dryer that has variable speed settings to choose from. For drying your dog’s face and neck, you won’t want to have the dryer speed set too high because it could frighten your pet. However, you’ll need a faster airflow for drying areas where the hair is thicker. Drying your dog with a dog dryer is relatively straightforward. Begin by drying the dog’s body. Place the dog dryer hose right up against the dog’s skin, and be careful to keep the temperature low enough not to burn your pet. Move the dryer up and down and side to side, using short strokes. Concentrate on drying from the roots of the hair outwards to give the coat more volume and bounce. Dry your dog’s head. Fold the dog’s ears down and be careful not to blow warm air into them. Dry the back of the dog’s head. If your dog won’t let you use the high velocity dog dryer on his head, don’t try to force him. Use a warm, fluffy towel to dry his head instead. In time, he may get used to the sensation and noise of the dryer and allow you to dry his head with it. A high velocity dog dryer is the best choice for dogs with thick, heavy coats. The Flying One High Velocity 4.0 Hp Motor Dog Pet Grooming Force Dryer has variable drying speeds and temperatures. Heat is generated by the dryer’s motor. It’s fully portable and has a long, flexible hose so it’s easy to reach every wet area on your pet. The dryer has a robust, steel outer shell and is built to last. The SHELANDY 3.2HP Stepless Adjustable Speed Pet Hair Force Dryer Dog Grooming Blower with Heater is a top pick for professional groomers and is also great for home use. This dog dryer has a very powerful motor and a heater with variable heat and speed settings. It is designed to be quieter than many other dog dryers and is fitted with a four-stage noise reduction device. The dryer comes with a selection of four different drying nozzles for the optimum grooming and drying experience for your dog. The Belinde Pet Hair Grooming Dryer for Dogs has two temperature settings and variable speed settings. It has a four-stage noise reduction system for ultra-quiet drying. The powerful motor ensures quick drying of even the thickest coats. The dryer comes with four different drying nozzles too. Our choice in this section is the 3.2HP 2 Speed Adjustable Heat Temperature Pet Grooming Force Hair Dryer. This dryer comes with four different drying and styling nozzles, two filters, and a free steel grooming comb. It has adjustable heat and speed settings, and a long flexible hose for ease of use. The company also offers a lifetime warranty on the product so if there’s a problem, you’ll have no problem in changing or replacing it. The Double K ChallengAir II Stand Dryer makes it much easier to dry a dog that fidgets. Unlike a conventional blow dryer, the stand dryer allows you to have both hands free to hold and gently restrain your pet while the powerful, fully adjustable dryer does its work. The stand is easy to assemble and very stable. The air-intake filter fitted to the dryer prevents internal parts from becoming dirty. The casing is dent-proof and won’t rust either. Although this dog dryer is pricier than other hand-held models, it’s built to last and would be ideal if your dog won’t keep still. Most professional groomers have cage dryers. Cage dryers make it much quicker to get a dog completely dry after it has been bathed. They are typically at the top of the dog dryer price point. Double K Industries ChallengAir 560 Cage Dryer. This cage and table dryer has a no-maintenance motor so you won’t need to worry about changing brushes or filters. Advanced technology ensures that animals are protected from overheating or chilling. The machine has a thermal sensor fitted as part of a temperature control system that tracks the temperature within the cage, greatly reducing the risk of harm or discomfort to the dog. The dryer is also fitted with a timer so there’s no risk of a dog being forgotten and left in a cage with the dryer switched on. The Puff-n-Fluff Dog Dryer is a really clever idea that’s perfect for drying dogs that tend to shake water from their fur all over your home after being bathed. 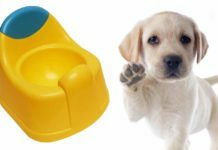 The Puff-n-Fluff Dog Dryer is made from a rectangular piece of material that has four elasticated leg holes. Simply place the dog’s paws through the openings, and then pull the sides together and fasten with the hook and loop. You then pull the drawstrings to close the gap around your dog’s tail and head. 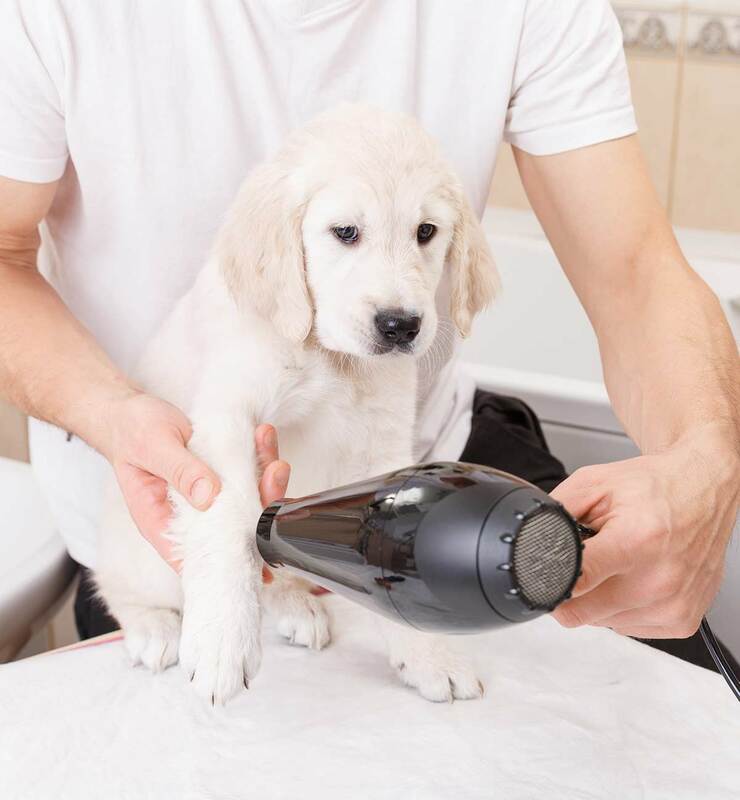 Next, attach your chosen dog blow dryer to the flexi-hose and allow warm air to circulate around your dog, effectively and quickly drying your pet without stress to the animal. 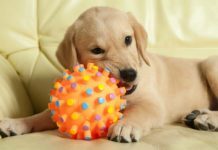 Once you’ve decided on the perfect dog dryer for your circumstances and for your pet, you’ll need to know how to keep it running smoothly. Maintaining your dryer properly will mean it works more efficiently and lasts longer too. First of all, you need to get rid of any hair that gets stuck in your dog dryer’s filters. Vacuum the filters, and then wash internal filters in a mild solution of dish soap and warm water. Keeping the filters clean will reduce the risk of the motor overheating and ultimately failing. Some dog dryers have one internal and one external filter. Consult the maker’s manual for instructions on how to remove and clean the filters. Always ensure that the filters are completely dry before replacing them in the dryer. If you choose a dryer with different mounting options (e.g. wall-mounting, stand-mounting), place a piece of sticky tape over the extra mounting holes. This will prevent hair and dirt from being sucked into the motor that could cause a blockage and failure. Sometimes, especially if you use your dryer a lot, the motor brushes will become worn, causing the dryer to slow down and then speed up again. If you carry on using your dryer with worn brushes, you could damage the motor. 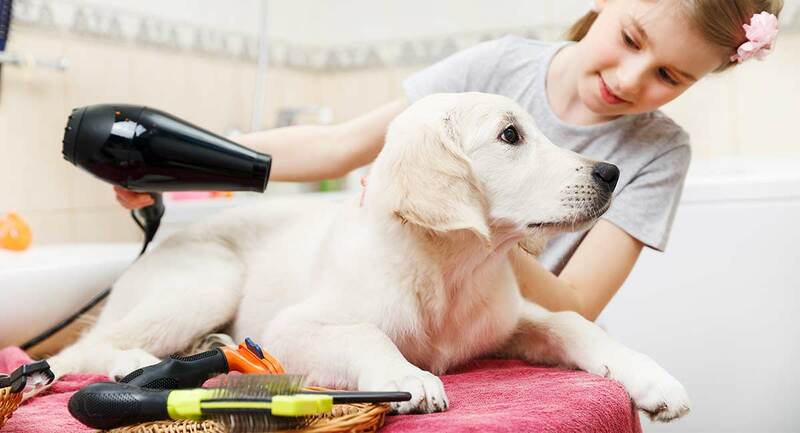 Be sure to have your dryer professionally cleaned and serviced annually, especially if you run a professional grooming salon or if you have a multi-dog household where the dryer is in frequent use. 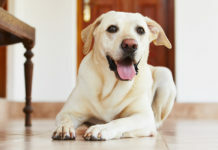 As you can see, there are several different options when it comes to choosing the best dog dryer. If you only want a dryer for home use, choose one that has variable speed and temperature settings so that you can make the drying experience perfect for your pet. If you run a professional dog grooming salon, you’ll need a dryer that is built to withstand relatively heavy use. A cage dryer might be the best option for you. Also, it’s wise to have two dryers in case one fails. If you have a dog dryer for your pet, tell us about it in the comments section below. We’d love to know what drying system you use, especially if you run a pro-grooming business. Next articleWhy Do Dogs Chase Their Tails?